I am always striving to eat healthier and reach my goal weight, as I am sure many of you are also! But with a busy family of five and work and other responsibilities, it can be hard to put healthy eating first, especially as the MOM! So when I had the chance to participate in a “Healthy Summer Slim Down Challenge,” a five day plant-based meal plan to help me kick start a healthy eating routine for the summer, hosted by Veestro, I was so excited! Finally, a chance for me to put myself first and eat healthily without extra work or time! 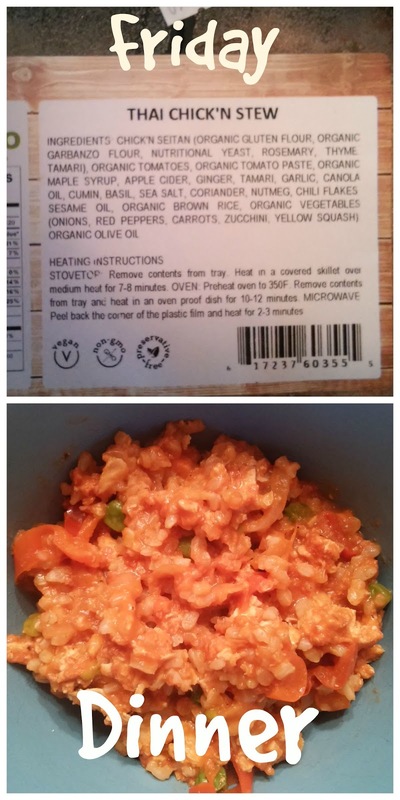 The folks at Veestro understand that not everyone has the time to cook, they know you are busy, but they also know that you want to eat a wholesome and nutritious meal. 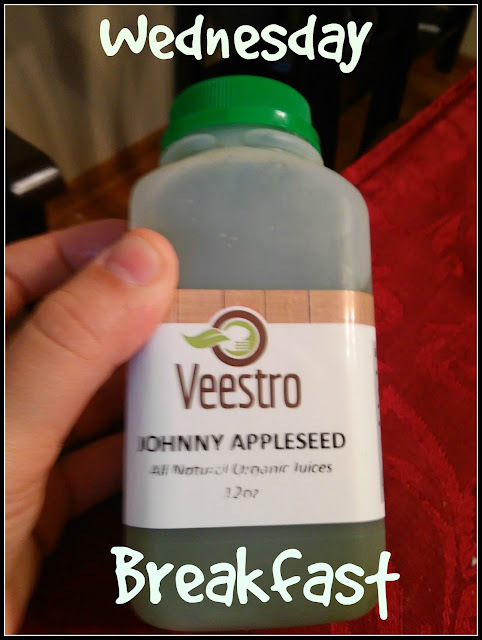 At Veestro everything is made fresh, using all-natural ingredients, no preservatives or animal products. You won’t have to worry about recipes, shopping or cooking. You don't calculate 'points,’ keep track of calories, or play games. You just grab a Veestro meal from the fridge or freezer, heat and eat. It's that easy! I received 15 ready-to-eat meals (Breakfast, Lunch, and Dinner for 5 days) to help me jumpstart my healthy eating routine. I will admit I was a bit nervous to start this week of meals. I'll be honest. I am not a fan of vegetarian alternatives like tofu but we do eat vegetarian meals at least three times a week so I am not unused to meals without meat. 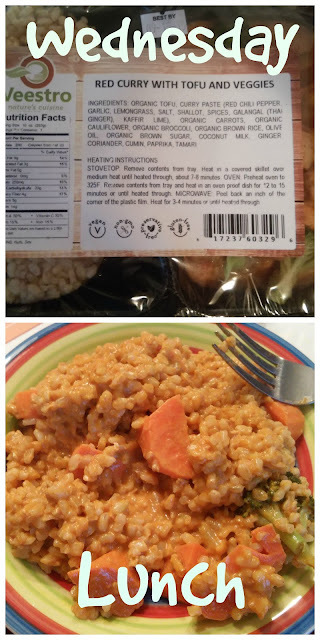 What I was excited about was the fact of learning more about vegetarian meals and getting ideas for what I can make in the future for our no-meat meals. And when I saw the Veestro only uses non-GMO foods and many organic ingredients, I was sold. It fit perfectly in our organic and natural diets that we are already have! I was sent a good variety of different types of meals, foods and even a juice. Not all of it looked good to me but I was determined to give each meal a try! AND I DID! My first meal to start off this week of Veestro meals was the Oatmeal Breakfast Pie. Since I eat oatmeal on a regular basis for breakfast, this was a easy start to my week. The Oatmeal Breakfast Pie was pretty good. I liked the added cranberries and I love all the organic ingredients like sweet potato! Then for lunch, I had a Enchilada Casserole. This meal included tofu, which I mentioned earlier I can't stomach. I just really don't like the texture. The casserole also turned out a little soggy. I definitely tried it but I ended up giving some to my kids (who really liked it!). I wasn't really a fan of the red sauce either. But what I do love is being able to share with my kids because of the healthy, non-GMO and organic ingredients! They were so interested in what I was eating throughout the week and I loved sharing! 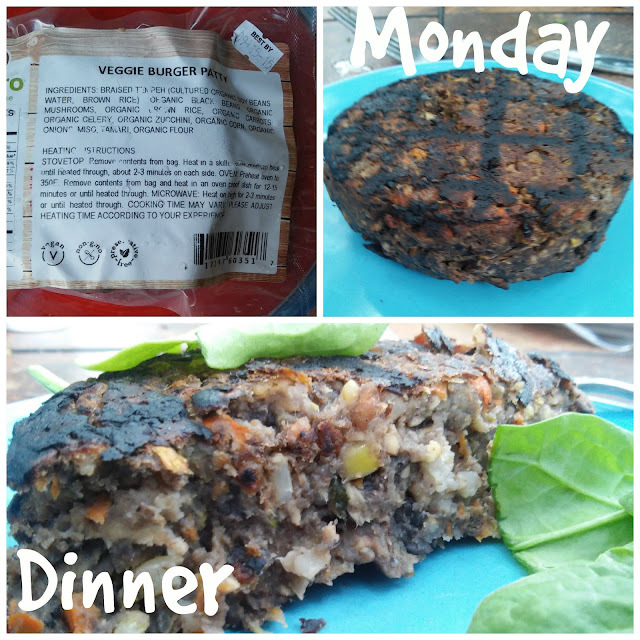 For supper, we grilled up the Veggie Burger! Now, I have tried Veggie Burgers in the past and have not been a fan. But I was determined to have an open mind and try it again. And this time, I really did like it! I love that this burger was made up of beans and veggies instead of tofu. 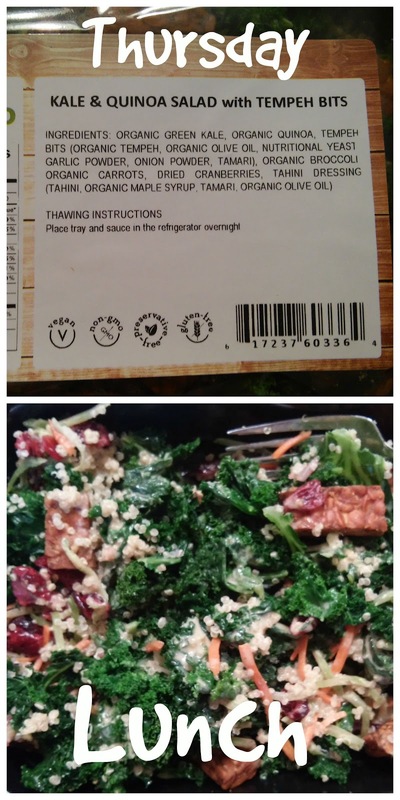 The texture was a little weird but I topped it with some fresh spinach and I ate it all! And I enjoyed it! This was definitely a meal I would eat again! Yeah for me! I completed a FULL day of the Veestro Challenge! I started this day off with the Three Layer Scramble. 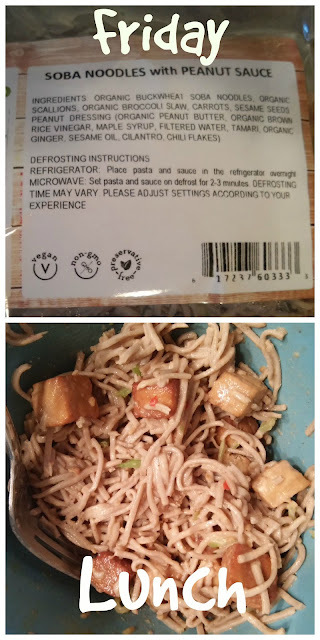 It was made with Tofu again so I tried it, ate around the tofu and overall enjoyed the taste. 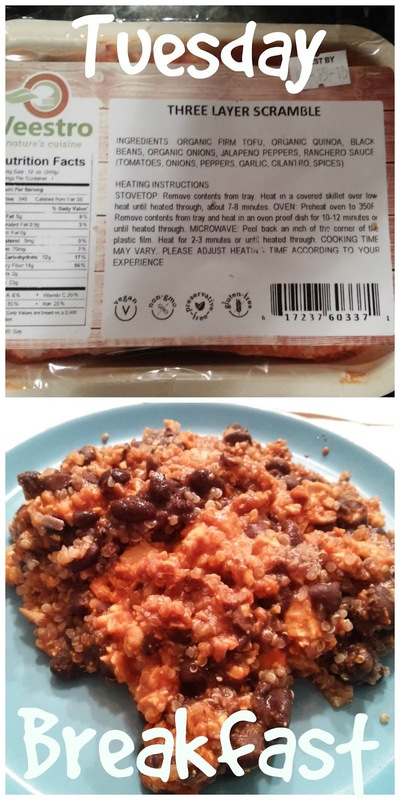 I liked the quinoa and it was definitely filling! My kids also enjoyed this meal! 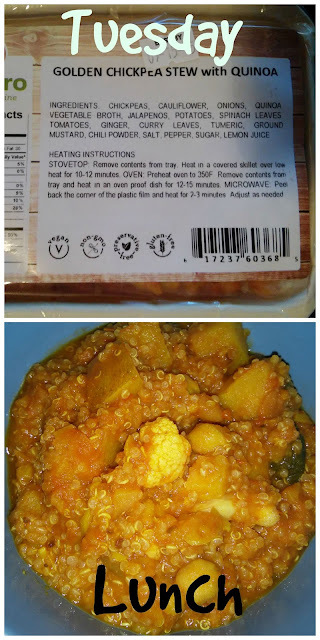 For lunch, I ate the Chickpea Stew! This meal I really enjoyed! It had a lot of my favorite foods including quinoa, vegetables and potatoes! It was overall really good and really filling! 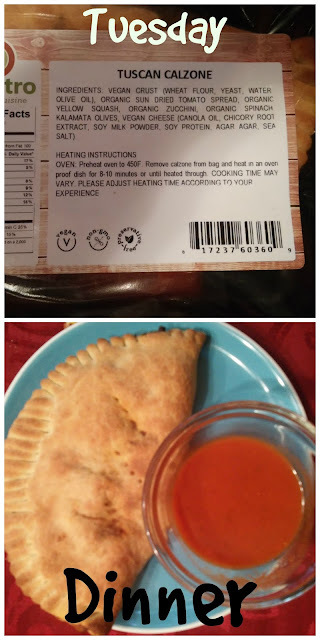 One of my favorite foods in life is Calzones so when I saw this on the menu for dinner, I was really excited to try it! This calzone was filled with vegetables and was overall really good! 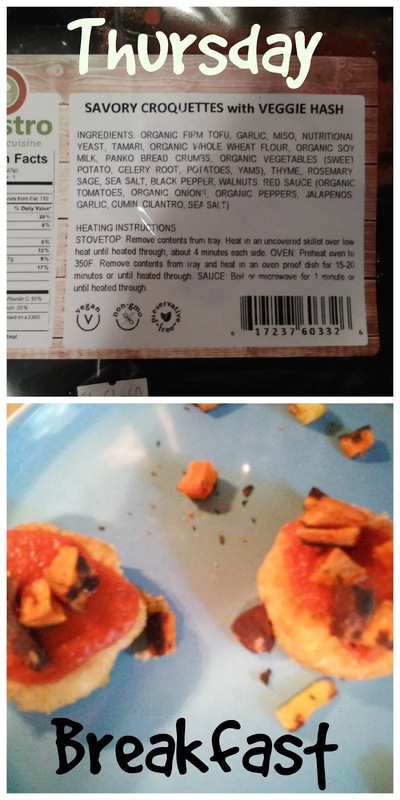 I didn't care for the vegan cheese (it ranks right up there with tofu!) but overall the crust was crisp, the red sauce was great for dipping and the vegetables tasted great in this calzone! This ended up being one of my favorites from the week! I started off my Wednesday with the Johnny Appleseed Organic Juice. With a little shaking to mix it up, this juice was REALLY good and refreshing! It felt like a really great way to start my day and it was so light and refreshing! One of my favorite ethnic foods is Curry so when I saw this Red Curry on the menu I was excited to try it...until I saw the Tofu with it. However, this time I could take out the tofu and without it, this meal was delicious!!! I loved all the added crispy veggies and the curry paste was really tasty! This ended up being another favorite meal for the week! Now I have to be honest to start with. I have never been a fan of eggplant and this meal just didn't look appetizing or taste appetizing. 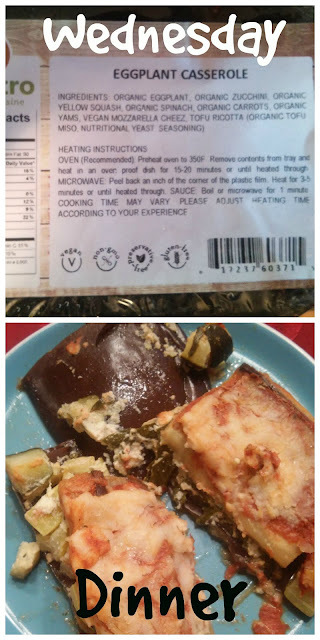 It ended up heating really soggy and fell apart everywhere and there were such HUGE pieces of eggplant. One bite for me was all I could do. I got my kids to try a bite of eggplant as well but even the kids wouldn't eat this meal. 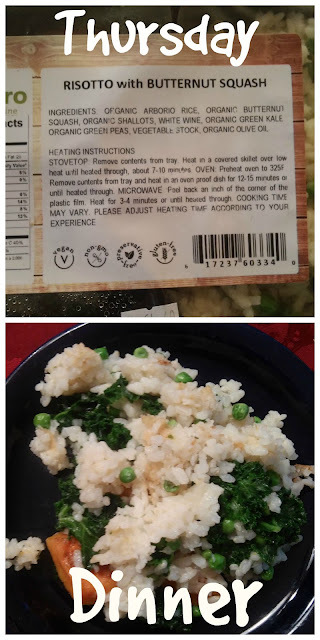 This ended up being the worst meal of the week for me. HOWEVER, if you like eggplant, you would DEFINITELY like this meal! Started off Thursday with the Croquettes and pretty much I could only eat the Veggie Hash, which I really liked. This meal just had too much tofu for me. The kids enjoyed it though! I am a big fan of salads and eat Kale usually for lunch everyday so I was really excited to try this Kale Salad. I love the addition of Quinoa and all the veggies and the Tahini dressing! This salad for me was one of the best I have ever eaten and definitely at the top of my favorite meal list for the week! This Risotto was another favorite! With the added Squash and Kale, it was healthy, tasty and not too overbearing in flavor! I really liked this and it was a top five favorite! I MADE it to the last day! And it hasn't been too tough! And I got to start off the day with these tasty Empanadas! These surprised me as being a favorite. They were crispy, filled with veggies and overall really, really good! This was a meal that I looked forward to trying because it was made with a peanut sauce. It was overall really good and the kids also enjoyed this one A LOT! I ended the week of Veestro meals with Thai Chick'N Stew. It wasn't one of my favorites and I wish I would have ended the week on a high note. The kids and I enjoyed the flavor but it was a little soggy and had giant pieces of red pepper and onion. 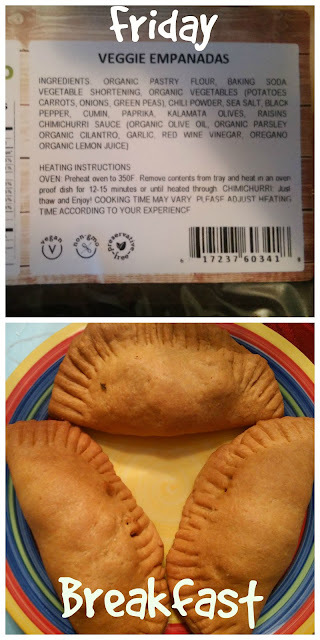 I really LOVED the idea behind Veestro meals and the convenience of having the meals already made and ready for me to just heat up. Although, the one downfall is it took a long time for some of the meals to heat up or some were soggy. That's the downfall of not cooking them up fresh yourself. But it really saved me A LOT of time not having to cook a meal for myself every day. I loved the variety of meals that Veestro offers. 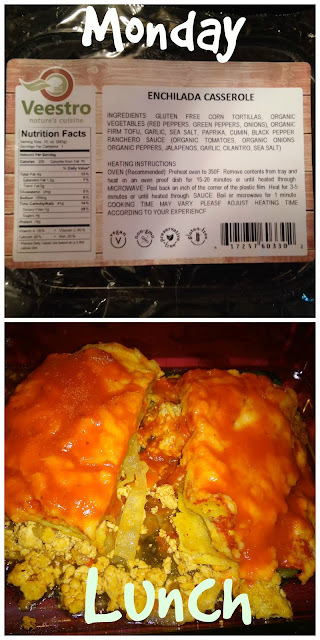 I wasn't a fan of tofu or veggie cheese but there are others out there that are so those meals are perfect for them. However, I was able to find many meals throughout the week that I did really enjoy like the Kale Salad, the Apple Juice, the Empanadas and the Risotto! I love not having to think about how to eat healthy for each meal. These meals had it all EVERY TIME. Healthy vegetables, healthy grains, healthy fruits and all non-GMO and organic! LOVED THAT! Overall, over five days I lost 4 pounds and I felt fuller after every meal than I do usually. I didn't snack as much or have sugar or salty cravings. I felt healthier and less tired. These meals really did keep my fuller longer and feeling great about myself and that was most important to me! If you want an easy meal plan that you know is made with real, healthy and natural and organic ingredients, I recommend Veestro meal plans. 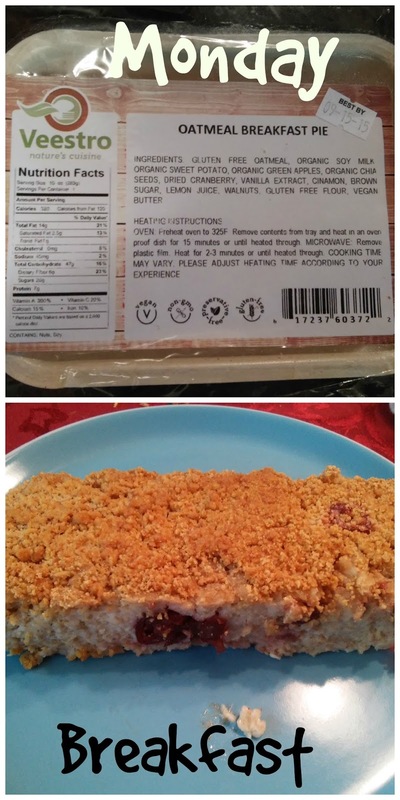 They list all their ingredients right on the package so you always know what you are eating and they are easy to heat and eat! I really enjoyed trying new foods throughout the week and broadening my horizons! You can purchase Veestro meals A La Carte or by Meal Plan on the Veestro website. And make sure to use promo code, REVIEWSTEW, to save 20% off your entire order! This code is valid through September 30th, 2015.